Troubled Pininfarina continues to shrink away, and most recently has exercised the 'put' option that allows it to force its French partner Bolloré Group to purchase its 50 percent stake in Véhicules Electriques Pininfarina Bolloré (VEPB). The sale of its half of the ambitious zero-emission city car project will raise 10 million euros for Pininfarina, cash that is needed as the company struggles to stay afloat. At the end of last month when signing off the 2010 accounts the board of directors was noncommittal about the design and engineering firm's ability to say afloat, saying in a statement that while there are "positive signs of improvement in the company’s business trends and, at the same time, some lingering questions about the ability of the Group and the Company to continue operating based on the going concern assumption." The directors added that they have "reasonable expectation that the group and the company will still have adequate resources to continue operating in the foreseeable future." The sale of its stake in VEPB is the latest twist in the "Bluecar" project which had been struggling for momentum with a dark cloud hanging over the whole enterprise until early last month when a deal was signed to build 4,000 units for a Paris car sharing scheme. On March 9, Pininfarina signed a preliminarily agreement with Cecomp, Bolloré and VEPB that involves the leasing of certain of its business operations and infrastructure that will be required to build the Bluecar, until December 31, 2013. The final agreement will be executed once the procedure required by the labor unions is completed. The business operations to be handed over by Pininfarina include the Bairo Canavese plant with its equipment as well as employment contracts of 57 staff. Over the period of the agreement Pininfarina will receive 14 million euros with the plant being used to manufacture 4,000 electric cars. These cars will be used by the Bolloré Group for a car sharing services that will launch in the autumn in Paris and in 40 neighboring municipalities. 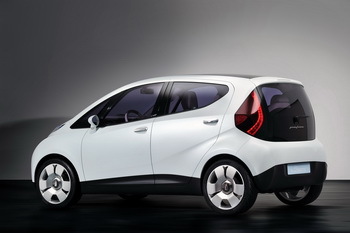 As struggling Pininfarina put it in a press release on March 9: "The success of this pilot project is particularly important for Pininfarina in terms of its future developmental and industrial impact on the possible production of electric automobiles on a larger scale." Pininfarina subsequently announced that it had "exercised the put option it held pursuant to the contractual stipulations of the agreement executed with the Bolloré Group in September 2010, by which it sold to its French partner its interest in the 50-50 joint venture called Véhicules Electriques Pininfarina Bolloré." With the gearing up towards production of the Bluecar now getting the green light, the stake sale is expected to close within the next fortnight.